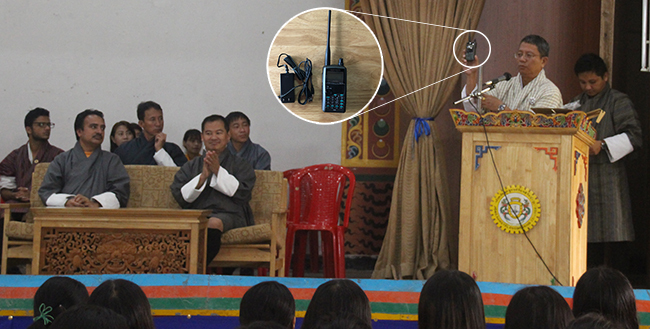 Jigme Namgyel Engineering College is a proud recipient of a KENWOOD TH-D72A handheld radio. The handheld radio is a soelra from His Majesty The King, to JNEC and four other colleges (with College of Science and Technology, Sherubtse College, Gyalpozhing College of IT and Royal Thimphu College) being fellow recipients. It is expected that with the KENWOOD handheld radio, text messages to BHUTAN-1, the country’s first satellite, could be sent. The messages would be broadcast to other users, capable of receiving text messages on amateur band within the coverage area of the satellite. It is His Majesty’s great vision that has enabled Bhutan to place its foot in the areas of space study, through BIRDS-2 project, with the launch of Bhutan’s first satellite, BHUTAN-1. The educational institutions are gifted with the radios with a vision to generate interest and enthusiasm in youth in the field of science, technology, engineering and mathematics. Jigme Namgyel Engineering College celebrates the successful launch of BHUTAN-1 and takes this prestigious soelra as a memento of motivation and commits to dedicate towards excellence in education and innovation.